Re-printed with permission from Bernard & Associates from Sporting Classic’s Oct 2010 Issue. Enjoy! The Au Sable springs from Otsego and Roscommon and then consolidates itself near Grayling before venturing forth on its long ramble home to Lake Huron. Along its tangled edges the dark forest rises deep and verdant in random stands of popple and maple and birch. Rich, young pin oaks fill the myriad patches of overgrown clearcut, along with all the other new growth that together provide habitat for the grouse that brought Betsy and me here for so many years on our annual October odyssey. For a little southern-born Brittany, it was at first an odd and capricious place. Yet throughout her life Betsy came to learn and love these great northern forests just as much she did those of her own country far to the south. And it was here on our first trip to Michigan that she met the grouse that forever changed her life. I remember that grouse. At first, I wasn’t quite sure what she had – especially after the incident earlier that morning with the snowshoe hare. In her defense, Betsy was barely out of kindergarten and still trying to figure out this business of being a bird dog. It was all strange country to her, with strange trees and strange smells and especially strange creatures – long-tailed pheasants bigger and more audacious than any grouse or quail she’d ever encountered, big prickly porcupines unlike any groundhog she’d ever seen – and now this, a rabbit twice as saucy as the most insolent cottontail that had ever challenged her to a chase. Yeah, I know . 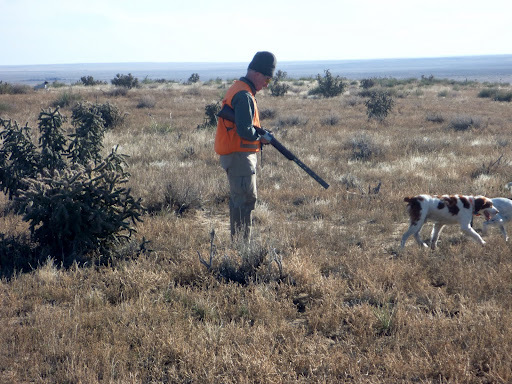 . . bird dogs aren’t supposed to pay attention to rabbits. But the country back home was overrun with rabbits, and she’d struggled with them from the time she was a pup when one had literally jumped up from beneath her nose. Now so far from home, she had no way of knowing the difference between a cottontail rabbit and a snowshoe hare. All she knew for certain was that this was one very irreverent creature with the biggest, smelliest feet that had ever assaulted her senses, and before either of us could do anything about it, Brer’ Brittany and Brer’ Hare were off on an impromptu frolic upriver, with me in hot pursuit using words and phrases she’d never heard before. It had only taken her a few seconds to realize the error of her ways, but by then it was too late and she knew it. And when she returned a minute or so later she had a repentant, hang-dog look on her little freckled face, and we both took a few extra moments to catch our collective breath before agreeing to forget the whole incident. By late afternoon the day had turned into a real gem, the autumn air crisp and clear and vibrant. We had bumped two grouse, both of them flushing wild, and I had resisted taking a shot at either lest Betsy get the idea that it was okay to chase birds. But now her demeanor was entirely different, with the cool evening breezes fetching messages of promise as she started getting birdy. One step forward, two steps back, then a quick 180 before she began to get the full picture, and suddenly everything became clear as she threaded her way through the thick scrub, first left toward the river, then out across a small clearing before she nosed into a young fallen pine. Twice she circled the downed pine, nose poking here, nose poking there, her little bobtail a blur until she finally determined that the bird was on the move. And so she started widening her circle and nearly stumbled as she pirouetted back on her own track where it crossed the grouse’s trail, bearing up and away from the river through a narrow crease to the high step above us. She was now fully committed to the bird, as I was to her, and I knew it was simply a matter of time and persistence until she either caught up with him or bumped him and caused him to flush wild. She was absolutely on tiptoe as she worked her way up through the crease, making notes as she went. I followed as discreetly as possible, giving her plenty of time and room to figure things out as the grouse made his way higher into the thick birch and maple above us. He was clearly on his home turf, burrowing deep into a dense stand of pin oaks as we topped out along a barely perceptible trail that led deep into the thickest tangle we’d seen so far. She was close now; I could tell it in the way she moved and by her quivering little tail and the percussive beat of the crisp evening air sifting through her nostrils. The bird was quickly running out of options – I knew it, she knew it and he knew it – and suddenly Betsy circled left, broke from the trail and completely vanished. I was stunned and for a moment disoriented and alone . . . where has she gone . . . where is the bird . . . where am I? And then she was there, poised dim and ghostly in the damask trail 20 feet ahead, locked up solid and pointing straight back toward me, tail high, head low, eyes large with her left front paw raised daintily to her quivering chin. The little gun floated free and weightless at half-rise in front of me, my thumb positioned firmly atop the safety, my finger resting lightly aside the trigger, the air as still and pure and perfect as the moment trembling timelessly around us. For 27 years I have held that moment as closely as Betsy held that bird. She hovered there, a pale apparition in the half-light, the unseen grouse as real a presence as my own pounding heart. I stood transfixed, awaiting the memory to come, until Time itself could no longer bear the strain and the bird rose from the forest floor between us in a thunderous rumble of leaves and dust, chestnut-flecked and dark-ruffed, tail ivory-rimmed and fanned wide, wings drumming, climbing, pleading for that singular cerulean patch of clear evening sky. The little gun buried itself deep into my shoulder as the bird came clear, and backlit feathers filled the air as he tumbled into a remembrance as fresh on this cold winter night in Tennessee as it was on that warm autumn evening in Michigan. e hunted the great Huron forest every year of her life for as long as Betsy was able, but I never returned there after she died. She was the best friend I ever had. And now it surely speaks of preference and priority that such a little dog could have brought so much peace and contentment to one man’s life, along with the constant introspection I always felt when in her presence. Her spirit was forthright and her affection unconditional, her greatest measure of devotion always free and sincere and for me alone. For it was I who carried her afield to hunt, I to whom she looked for love and play and a more-than-occasional egg or slice of toast to garnish her daily ration, by whose side she waited expectantly as I cleaned our birds and to whose lap she entrusted her weary head at day’s end. Our life together was one of mutual admiration and dependence. I bore the gun, and she brought her nose and instincts. She swept the hollows and ridges and thickets, and I carried her water and her biscuits and her bowl. Over the years I became more and more tolerant of her infrequent indiscretions and she of my increasingly recurrent pauses for rest. We never asked perfection of one another, only understanding, each knowing the proper time to defer to the other’s gifts – I when to stop and give her time to do her work, and she when to cast a glance over her shoulder to check my proximity. And together we shared the fruits – the solitude and companionship, the occasions that brought us together to a far sweeter existence than either of us had alone. We shared the same cup, ate the same bread, breathed the same air and drank from the same stream, our faces hard down in the water shoulder to shoulder, soul to soul. When quenched we would arise, and she would whine that we should be on our way and soon we’d again be deep in thought among the trees. She got the livers and the hearts and left me the rest.